Deepen your sense of the past at sights like Tusayan Museum and Hermit's Rest. Step out of the city life by going to Canyon Village Marketplace and North Kaibab Trail. 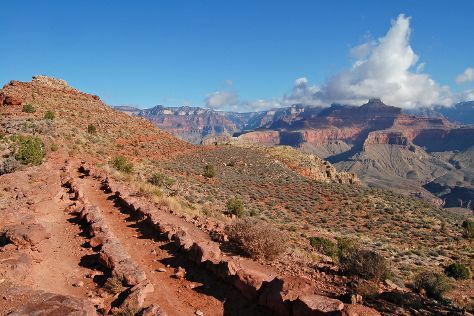 On the 5th (Wed), hike the day away at Bright Angel Trail. The adventure continues: take in breathtaking views at Grand Canyon South Rim, tour the pleasant surroundings at South Kaibab Trail, take some stellar pictures from Mather Point, and make a trip to Grand Canyon Village. To find where to stay, photos, and other tourist information, use the Grand Canyon National Park day trip planning website . Expect a daytime high around 85°F in June, and nighttime lows around 42°F. Finish up your sightseeing early on the 11th (Tue) so you can travel back home.